Abstract: Denver Snuffer posted an essay entitled “Plural Marriage” on March 22, 2015. 1 It is apparently a transcription of a recent talk he had given and provides his followers with his views on Joseph Smith and plural marriage. Snuffer’s basic conclusion is that the Prophet did not practice polygamy. He alleges that the historical evidences that support Joseph’s participation should instead be attributed to John C. Bennett’s activities in Nauvoo in 1840–1842 or blamed on Brigham Young’s behaviors and teachings after the martyrdom. This article provides references to dozens of documents that counter this conclusion and shows plainly that Snuffer is in error. On page 28 of the transcript, Snuffer shifts away from the subject of plural marriage, touching on several themes he has written on before. Part 2 of this response will specifically address those twenty pages of Denver Snuffer’s claims. Apparently some of his followers were polygamists before embracing his teachings. Having then been “rebaptized” by him or under his direction, they sought his advice on the status of their plural unions, as well as his beliefs regarding Joseph Smith’s involvement in polygamy. Doubtless, those that were living in plural relationships were anxious to learn how his counsel might affect their polygamous families. Other followers might have wondered what the future held concerning Snuffer’s teachings on exaltation and plurality. Because Snuffer chose to single out my Joseph Smith’s Polygamy: History and Theology as a primary reference for his ideas, I felt it might be useful to address his assertions. They not only call into question my interpretations but also mirror a trendy reconstruction gaining traction on the Internet and elsewhere that seeks to deny the nature of Joseph’s actual involvement in the practice. Concerning my attempt to lay out a timeline of Joseph Smith’s interactions with polygamy, Snuffer writes: “I take issue with the speculative chronology in these books” (italics mine). Indeed chronology is very important. A speculative chronology would not be one based upon historical evidence but instead upon opinion and conjecture. Snuffer and I agree that such would not be useful to seekers desiring the truth. Snuffer declares: “I am only interested in addressing one thing: What did Joseph Smith understand, teach, and do related to the subject of the plurality of wives” (p. 2). Yet, he quotes very few people who heard Joseph Smith teach, even though such references are readily available in multiple published and primary sources. Early in Snuffer’s speech, he explains his own interpretation of Joseph Smith’s teachings and behaviors regarding plural marriage, but nowhere does he address the plain evidences that contradict his position. It is similar to a courtroom battle where [Page 3]only the prosecution is allowed to testify. While classed with Mormon fundamentalists in many of his views, Snuffer rejects modern polygamy and invites contemporary polygamists to desist from their plural behaviors: “Those who are in polygamy now being baptized to leave it [sic], need to end the practice with them” (p. 42). Though sometimes subtle, throughout the text Denver Snuffer portrays himself as a new guiding visionary to readers. This relevance to plural marriage is not obvious. Despite these declarations, Snuffer also alleges “there is some proof” that Joseph had improper relations with a woman (p. 45). Proof is a strong word for an attorney and sends a subtle and conflicting message. Of course Snuffer is entitled to his opinion but his response piles two faulty speculations on top of each other in order to advance his interpretation. Snuffer asserts that polygamy would have been adultery. This is inaccurate according to modern-day revelation. Joseph Smith’s first inquiry regarding Old Testament polygamy was to discover how such behaviors had been justified. That is, how could Abraham and Jacob practice plural marriage without committing adultery? Verily, thus saith the Lord unto you my servant Joseph, that inasmuch as you have inquired of my hand to know and understand wherein I, the Lord, justified my servants Abraham, Isaac, and Jacob, as also Moses, David and Solomon, my servants, as touching the principle and doctrine of their having many wives and concubines. Portions of the remaining revelation discuss how ancient patriarchs entered into plural unions and had children by polygamous wives without committing sin. For example, Abraham’s wife Sarah bore Isaac and his other wife Hagar bore Ishmael. Concerning Abraham’s other children, the Old Testament reads: “Unto the sons of the concubines, which Abraham had, Abraham gave gifts, and sent them away” (Genesis 25:6). Abraham’s grandson Jacob had twelve sons by four women (Genesis 35:23–26). According to Latter-day Saint canonized doctrine, none of the fathers and mothers in these polygamous families committed sin in their marital behaviors. The divinely sanctioned practice of Old Testament polygamy needs to be addressed if any author (including Denver Snuffer) is going to assert that latter-day polygamy is inherently adulterous. Nowhere in D&C 132 does the Lord condemn authorized polygamy. Using Old Testament language where men were considered to have ownership of their wives and children, verse 61 states plainly that if a man espouse a second wife by proper authority, “then is he justified; he cannot commit adultery for they are given unto him; for he cannot commit adultery with that that belongeth unto him and to no one else” (italics added). [Page 6]In short, asserting that Church-authorized plural marriages in Joseph Smith’s day were adultery is not substantiated by any known scripture or teachings from that period. The next assertion advanced by Snuffer is that Joseph did not consummate his plural marriages because they were only spiritual (not physical) marriages. This idea contradicts one of the reasons for plural marriage that is plainly declared in the revelation. Verse 63 states: “for they are given unto him to multiply and replenish the earth, according to my commandment … that they may bear the souls of men.” The language is unambiguous. To “multiply and replenish the earth” requires sexual relations. Additional evidence supporting sexuality can be identified in the historical record regarding other plural wives including Eliza Maria Partridge, Almera Woodard Johnson, Maria Lawrence, Sarah Lawrence, Olive Frost, and Mary Heron. Children from Joseph Smith’s Plural Wives? The verbiage chosen by Snuffer is unfortunate. Offspring from one of Joseph Smith’s plural unions would not be surprising and would not constitute an accusation. Regardless, it is true that DNA testing of available candidates has not produced a single uncontestable positive. However, Josephine Lyon, daughter of Sylvia Lyon, is positive but as Ugo Perego explains: “In light of the multiple familial relationships shared by both Josephine Lyons and Joseph Smith’s descendants, it is clear that a lot of ‘genealogical noise’ is also present.”16 The result is inconclusive, not negative. [Page 10]Hopefully these brief documentary references show plainly that asserting, as Snuffer does, that plural marriage would have been adultery in light of the theology taught by Joseph Smith and that the Prophet did not practice it is contradicted by multiple reliable evidences. If Snuffer wishes to successfully advance his unique interpretation, he should also address these evidences rather than hope that this audience will not be aware of them. The weaknesses of Snuffer’s arguments do not mean that he fails to provide a case in support of his position. He promotes several evidences that might validate his views. But as shown below, the historical topics he chooses to discuss do not directly defend his interpretation, but are more akin to diversions away from the pertinent primary documents. Unfortunately for his readers, Snuffer’s discussion regarding Fanny Alger is like beating a dead horse. I have accumulated the twenty known historical manuscripts referring to the incident.24 A couple of them could be used to support the existence of sexual relations, but, as both Denver and I agree, the evidence is inconclusive. The observation that no children are documented arising from the union is not particularly meaningful. For several reasons, manuscript evidence of a child might not have persisted in the historical record. Neither do we know how long after the marriage ceremony was performed that the union was discovered by Emma and was practically dissolved when Emma sent Fanny away. It could have been months or years, but it also could have been just weeks. [Page 11]Snuffer’s observations regarding Fanny Alger are not particularly thorough or applicable to the question of whether Joseph consummated any of his plural marriages. Regarding such questions, Fanny is a poor example and hardly worth mentioning because the available evidences describing their interactions are so sparse and contradictory. There are multiple problems with such an interpretation, primary among them is the timeline. Available evidence indicates that at the time Bennett became estranged from Joseph (April–May of 1842), the Prophet may have been the only authorized polygamist in Nauvoo. By that date he had been sealed to perhaps seven women (Louisa Beaman, Zina [Page 12]Huntington, Presendia Huntington, Agnes Coolbrith, Mary Elizabeth Rollins, Patty Bartlett, and Marinda Johnson), most of whom were plausibly nonsexual, eternity-only sealings. The bulk of Joseph Smith’s plural marrying occurred well after Bennett was out of the picture. As shown in the chart, the vast majority of the Prophet’s plural marriages for time and eternity occurred after John C. Bennett had moved east away from the Saints. These charts demonstrate that the majority of Nauvoo plural unions were sealed well after Bennett had left Nauvoo, and his friendship with Joseph had been severed. Coupling that detail with the multiple evidences that Joseph Smith did not teach Bennett about eternal plural marriage demonstrates that Snuffer’s extended examination of John C. Bennett is not helpful in discerning any of the important details of Joseph Smith’s introduction of polygamy because that expansion occurred well after Bennett had left the picture. Why would any truth seeker ignore the teachings of men and women who were personally taught by Joseph Smith? [Page 23]Calling at the house of the prophet one day, early in the spring of 1844, on some business or other not now remembered, the prophet invited me into a room up stairs in his house, called the Mansion. After \we/ entered the room he locked it \the door,/ and then asked me if I had heard the rumors connecting him with polygamy. I told him I had. He then began a defense of the doctrine by referring to the Old Testament. I told him I did not want to hear that as I could read it for my self. A. I got it from Joseph Smith. Q. Now you are sure of that? Q. Was it in print, or was it in manuscript? Just answer that question? In a limited way, Snuffer acknowledges that evidences like those presented above exist (pp. 4–5), but his willingness to ignore them is surprising. It is true that late, secondhand narratives are not as reliable as contemporaneous firsthand accounts. However, thorough scholars investigate all pertinent evidences to evaluate them based upon their individual credibility and validity. Thereafter, researchers may not agree at their significances, but eliminating an entire category of evidence simply based upon one characteristic is seldom, if ever, justified. In this case, Snuffer essentially ignores anything but firsthand accounts, which are very few in number. This approach is inherently less effective in discovering historical truth, but may be useful if an author is driven by a specific agenda that would not be better served by casting a wider evidentiary net. Declarations from dozens of Nauvoo polygamists are available in documents posted at MormonPolygamyDocuments.org and are charted in “Yes, Abraham, Jacob, and Joseph Smith Practiced Polygamy.”59 Denver Snuffer might claim that the available testimonies describe non-physical spiritual unions, but in doing so he would be manifesting ignorance of the statements themselves. These witnesses declared they practiced plural marriage like Abraham and Jacob in the fullest sense. They agree Joseph Smith taught plural marriage, practiced plural marriage, and authorized others to do so. Denver Snuffer’s treatment of Joseph Smith and plural marriage suffers from two primary weaknesses. First, his scholarly treatment is inadequate. He examines three historical considerations to defend his interpretation, initially by discussing Fanny Alger, but she is a tangential issue at best. Next he implies that Nauvoo polygamy rumors were [Page 28]traceable to John C. Bennett. Lastly, he tries to pin the responsibility for later polygamy squarely on Brigham Young. There is no way to get to the heart of the issue through such tactics. The second problem involves the volume of evidences he ignores, evidences that contradict his reconstruction. In 1770, John Adams observed: “Facts are stubborn things; and whatever may be our wishes, our inclinations, or the dictates of our passion, they cannot alter the state of facts and evidence.”60 By largely ignoring the available manuscripts, Snuffer frees himself to take the storyline in his own direction, largely unfettered by historical data. But in doing so, he risks creating, not documented history but rather historical fiction. He may like it and his followers may believe it, but it will not constitute truth, which Joseph Smith defined as “things as they really are” (Jacob 4:13: see also D&C 93:24). Hopefully these evidences demonstrate plainly that Denver Snuffer’s theory that “It would be bigamy to marry another woman for this life while having an existing wife” and that “If he added others, it was for the afterlife and not for bigamy” (p. 2) are incomplete. The references quoted above and others that could be provided demonstrate undeniably that Joseph was the initial source of all teachings regarding eternal plural marriage. While some of his sealings were non-sexual, eternity-only unions, most were time-and-eternity plural marriages. It is also clear that the Prophet facilitated time-and-eternity plural marriages for Latter-day Saints of the Nauvoo period. It appears the only way to sustain Denver Snuffer’s position on Joseph Smith and plural marriage is to deny the evidence. In its place Snuffer has substituted an alternate reality that removes polygamy as an historical reality, instead relegating it to rumors of John C. Bennett or adulteries of Brigham Young. 1. Denver Snuffer, “Plural Marriage,” accessed June 19, 2015, http://denversnuffer.com/wp/wp-content/uploads/2015/04/Plural-Marriage.pdf. 2. He even mentions that at one point I had offered to co-author a book on polygamy with him, but my reasons for making the offer were perhaps less than obvious: I simply hoped that my involvement in such a project would prevent him from misrepresenting the historical record as I knew he had done in the past regarding other topics. 3. Joseph B. Noble speaking at a quarterly stake conference held at Centerville, Davis Co., Utah, June 11, 1883. Quoted in Andrew Jenson, “Plural Marriage,” Historical Record 6 (July 1887): 232–33. See Brigham H. Roberts’s introduction to volume five of the history of Joseph Smith, History of the Church of Jesus Christ of Latter-day Saints, ed. B. H. Roberts, 2nd ed. rev., 7 vols. (Salt Lake City: Deseret Book, 1960), 5:xxix; see also Hubert Howe Bancroft, History of Utah (San Francisco: A. L. Bancroft Co., 1889), 161–62. 4. Mark Staker, Hearken O Ye People: The Historical Setting for Joseph Smith’s Ohio Revelations (Salt Lake City: Greg Kofford Books, 2009 ), 117n22. 5. Snuffer writes: “I have dated the first portion of Section 132 in 1829” (p. 7), claiming that Oliver Cowdery sought to enter plurality at that time. Snuffer is undoubtedly in error. Oliver was unmarried in 1829. To enter polygamy he would have needed to marry two women. 6. Apostle Erastus Snow taught: “God has reserved to Himself this right to command His people when it seemeth to Him good and to accomplish the object He has in view — that is, to raise up a righteous seed, a seed that will pay respect to His law and will build up Zion in the earth.” Erastus Snow, Journal of Discourses, 24:165 (June 24th, 1883). 7. Helen Mar Kimball Whitney, Why We Practice Plural Marriage (Salt Lake City: Juvenile Instructor Office, 1884), 7. 8. Emily Dow Partridge Young, deposition, Temple Lot Transcript, Part 3, pp. 371, 384, questions 480–84, 747, 751–62. 9. Malissa Lott, deposition, Temple Lot Transcript, Part 3, pp. 97, 105–6, questions 87–93, 224–60. 10. Melissa Lott Willes, statement, August 4, 1893, CHL. 11. Lucy Walker, deposition, Temple Lot Transcript, Respondent’s Testimony, Part 3, pp. 450–51, 468, 473, questions 29–30, 463–74, 586. 12. See Angus Cannon, “Statement of an Interview with Joseph Smith III, 1905, Regarding Conversation on October 12, 1905.” MS 3166, CHL; D. H. Morris, untitled typed statement, June 12, 1930. Text begins: “The following was given by Judge D. H. Morris of St. George, Utah …” Marriott Library, Vesta P. Crawford Papers, University of Utah, Salt Lake City, Utah, MS 125, Box 1, fd. 5. 13. Joseph B. Noble, deposition, Temple Lot Case, Part 3, pp. 396, 426–27, questions, 52–53, 681–704. 14. Benjamin Winchester, testimony to Joseph Smith III, Council Bluffs, Iowa, November 27, 1900. 15. Dean R. Zimmerman, ed., I Knew the Prophets: An Analysis of the Letter of Benjamin F. Johnson to George F. Gibbs, Reporting Doctrinal Views of Joseph Smith and Brigham Young (Bountiful, Utah: Horizon, 1976), 43–44. 16. Ugo A. Perego, “Joseph Smith, the Question of Polygamous Offspring, and DNA Analysis,” in The Persistence of Polygamy: Joseph Smith and the Origins of Mormon Polygamy, eds. Newell G. Bringhurst and Craig L. Foster (Independence, Mo. : John Whitmer Books, 2010), 255. 17. Mary Elizabeth Rollins Lightner, “Remarks,” given at Brigham Young University, April 14, 1905, Harold B. Lee Library, Special Collections, Brigham Young University, Provo, Utah, MSS 363, fd. 6, 5. Mary Ann Barzee Boice stated in her “History,” that “some” of Joseph Smith’s plural wives “had children.” Quoted in D. Michael Quinn Papers — Addition — Uncat WA, MS 244 [Accession:19990209-c], Box 1. 18. J. D. Stead, Doctrines and Dogmas of Brighamism Exposed (Lamoni, Iowa: RLDS Church, 1911), 218. 19. See James Whitehead, interview conducted by Joseph Smith III, April 20, 1885. Original in possession of John Hajicek. Olive Frost died October 6, 1845. 20. Joseph E. Robinson, autobiography, recounting October 26, 1902, MS 7866, CHL. 21. Transcript in D. Michael Quinn Papers — Addition — Uncat WA, MS 244 [Accession:19990209-c], Box 1. 22. For a history of Lucy Meserve Smith (1817–1892), see Kenneth W. Godfrey, Audrey M. Godfrey, and Jill Mulvay Derr, Women’s Voices: An Untold History of the Latter-day Saints, 1830–1900 (Salt Lake City: Deseret Book Company, 1982), 261–71. 23. Lucy Meserve Smith, statement, Wilford Wood Collection of Church Historical Materials, Microfilm at CHL, MS 8617, Reel 8, Internal reference within collection — 4-N-b-2. For a very similar handwritten statement dated May 18, 1892, and signed by Lucy M. Smith, see copy of holograph in Linda King Newell Collection, Marriott Library. 24. Brian C. Hales, Joseph Smith’s Polygamy, 3 vols. (Salt Lake City: Kofford Books, 2013), 2:369–78 (Appendix D). 25. See also Brian C. Hales, “John C. Bennett and Joseph Smith’s Polygamy: Addressing the Question of Reliability,” Journal of Mormon History 41/2 (April 2015): 131–81. 26. See Mary Elizabeth Rollins Lightner, letter to Emmeline B. Wells, Summer 1905, MS 282, CHL. 27. Dean C. Jessee, ed., The Papers of Joseph Smith: Journal, 1832–1842, 2 vols. (Salt Lake City: Deseret Book, 1992), 2:335–84. In addition, John Taylor was mentioned eight times, Wilford Woodruff six, Newel K. Whitney five, William Marks four, and Orson Pratt three. 28. Jessee, ed., The Papers of Joseph Smith: Journal, 1832–1842, 2:345. 29. Eldon J. Watson, Manuscript History of Brigham Young (Salt Lake City: Smith Secretarial Service, 1969), 154. See also Journal History, CHL, for date. 30. Helen Mar Kimball Whitney, “Scenes and Incidents in Nauvoo,” Woman’s Exponent 10 (August 15, 1881): 42; emphasis hers. 31. John Taylor, “Sermon in Honor of the Martyrdom,” June 27, 1854, Papers of George D. Watt, MS 4534, Box 2, Disk 2, images 151–52, CHL. Sermon not in Journal of Discourses or in CR 100 317. Transcribed by LaJean Purcell Carruth, September 1, 2009. Used by permission. Terminal punctuation and initial capitals added. 32. John Taylor, quoted in Minutes of the Apostles of The Church of Jesus Christ of Latter-day Saints, 1835–1893 (Salt Lake City: Privately Published, 2010), 342 (October 14, 1882). 33. Wilford Woodruff, deposition, Temple Lot Transcript, Respondent’s Testimony, Part 3, pages 10, 58, questions 62–64, 573–80. Woodruff’s recollection of a six-month teaching period fits quite well with the documented meetings from August 1841 to March 1842, with the most intense period being in the late fall and winter of 1841–42. 34. George A. Smith, letter to Joseph Smith III, October 9, 1869, Journal History. 35. Warren Foote (1817–1903), autobiography and journal, MS 1123, 3 vols., 1:83, CHL. 36. Brigham Young, in Journal of Discourses, 18:241 (June 23, 1874). 37. Brigham Young, in Journal of Discourses, 3:266 (July 14, 1855). 38. Joseph Kelting, affidavit, September 11, 1903, CHL. 39. Wilford Woodruff, deposition, Temple Lot Transcript, Respondent’s Testimony, Part 3, pp. 56 question 536; sentence order reversed. 40. George Q. Cannon was not personally taught by the Prophet. He converted and joined the Saints after Joseph’s death. 41. Cyrus Wheelock, deposition, Temple Lot Transcript, Respondent’s Testimony, Part 3, p. 538, question 78. 42. Ibid., p. 539, question 80. See also questions 107, 136, 139, 142. 43. Samuel W. Richards, deposition, Temple Lot Transcript, Respondent’s Testimony, Part 3, page 572, question 129. 44. Joseph Kingsbury, deposition, Temple Lot Transcript, Respondent’s Testimony, Part 3, page 178, question 18. 45. Joseph F. Smith Affidavit Books, MS 3423, fd. 51:76, CHL. 46. Joseph A. Kelting, “Statement,” Joseph Smith Affidavits, images 11–16a, CHL. 47. Joseph Kelting, affidavit, September 11, 1903, CHL. 48. Mary Ann West, deposition, Temple Lot Transcript, Respondent’s Testimony, Part 3, pages 495–96, 504, questions 13, 272. According to her testimony, this was the only time she discussed plural marriage with the Prophet. See ibid., page 503, questions 264–65. 49. Mercy Rachel Thompson, deposition, Temple Lot Transcript, Respondent’s Testimony, Part 3, pages 238–40, 263–64, questions 23–31, 512, 522. 50. Mercy R. Thompson, letter to Joseph Smith III, September 5, 1885, copy forwarded to Joseph F. Smith, Joseph F. Smith Collection, MS 1325, fd. 12, CHL. See also “Letter from Mercy R. Thompson,” September 5, 1885, The Saints Herald, 8/12 (June, 1886): 641–42. 51. Mercy Rachel Thompson, deposition, Temple Lot Transcript, Respondent’s Testimony, Part 3, page 250, questions 244. 52. Undated quotation in Joseph Smith III, “Plural Marriage in America,” The Arena 23/5 (May 1903): 460. 53. “An Important Testimony,” letter of Mercy R. Thompson to A. M. Musser, January 31, 1886, Deseret News, Salt Lake City, February 6, 1886. 54. Aroet L. Hale, “Reminiscence,” (ca. 1882), MS 1509, 28–29, CHL; spelling and punctuation standardized. See also Aroet L. Hale, “Journal of Aroet L. Hale,” typescript, USHS A 554, pages 8–9. 55. This is the author’s great-great-great-grandfather or his great-grand uncle. 56. Charles Lambert, “Autobiography [ca. 1885],” typescript, MS 1130, Folder 1, page 16, CHL. 57. Malissa Lott, deposition, Temple Lot Transcript, Respondent’s Testimony, Part 3, page 101, questions 165–69. 58. Lucy Walker, deposition, Temple Lot Transcript, Respondent’s testimony, Part 3, page 452, questions 66–68. 59. 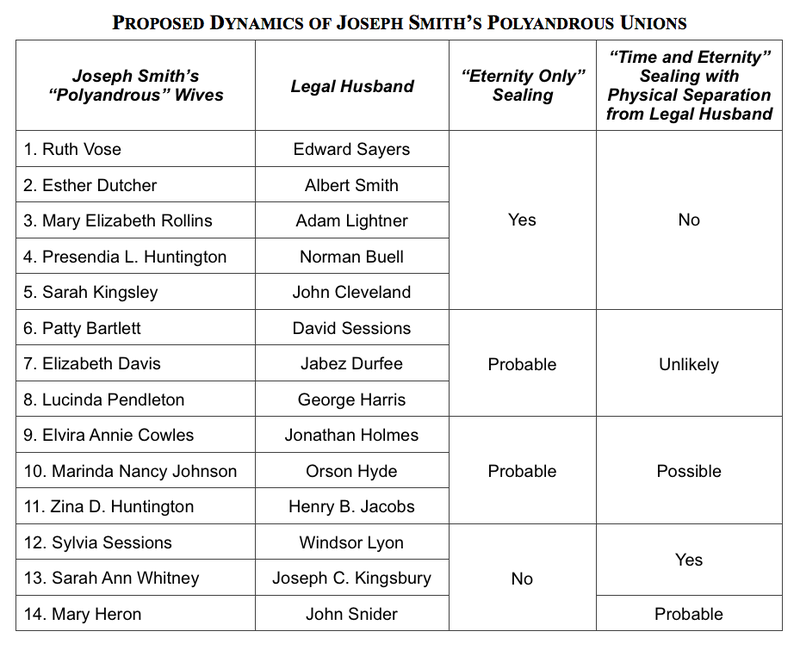 See also Brian C. Hales, “Yes, Abraham, Jacob, and Joseph Smith Practiced Polygamy,” accessed June 19, 2015, http://josephsmithspolygamy.org/yes-abraham-jacob-and-joseph-smith-practiced-polygamy/. 60. John Adams, John Adams Quotes, accessed June 19, 2015, http://www.thefederalistpapers.org/founders/john-adams. Posted in Review Essay and tagged Denver C. Snuffer, plural marriage, polygamy on June 26, 2015 . Bookmark the permalink. The ability to understand what Denver is saying requires you to remove what you have been told about what was said and documented and read it for what is on the paper. When celestial marriage is mentioned, the LDS member thinks polygamy, you must unlearn what you have learned in order to see clearly what was being conveyed. It is a most holy doctrine if you will understand it, and it has nothing to do with increasing the number of children being born on earth. If God desired this thing to increase the birth rate, then he would have created 50 women for Adam, and sent 10 or more for Noah and his sons on the Ark. But alas, it was one man and one woman in each of those Genesis events. This is why we must throw out the wisdom of the wise, and seek that spirit that guides us into all truth. That is what McConkie said at least. I have done my own research into this, including much on my knees. It has become such a mess, that the beauty of what Joseph was trying to establish has become beyond our view. I know you are trying to prevent people from being led astray by Denver, and I applaud you for that. I do not want anyone led astray by anyone. The contradictions of section 132 to the scriptures established prior to its existence should be looked into. We should discover through a thorough study of the Book of Mormon, mainly the book of Mosiah about what it means to raise up seed unto Christ. Then the meaning of it all will come into view and we will see the folly that existed with the great patriarchs prior to them entering into covenants with God, and see that we too can be eligible for those same covenants. 1. As part of the “restitution of all things” prophesied in Acts 3:19–21 (D&C 132:40, 45). 2. To provide a customized trial for the Saints of that time and place (see D&C 132:32, 51). 3. To provide bodies for noble premortal spirits by “multiplying and replenishing the earth” (D&C 132:63). 4. To allow all worthy women to be sealed to an eternal husband “for their exaltation in the eternal worlds” (D&C 132:63, 16–17). When anyone says that celestial marriage “has nothing to do with increasing the number of children being born on earth” I puzzle because D&C 132:63 states plainly in unambiguous language that one of the reasons for plurality is to “multiply and replenish the earth,” which is to have children. Of course, it is not the only reason or even the most important, which I believe to be the fourth. You have made other comments I don’t understand, and I respect the right of every person to receive revelation for themselves. It sounds like you may have received some interesting insights. Yet I hope we all agree with Joseph Smith’s counsel: “if any person have a vision or a visitation from a heavenly messenger, it must be for his own benefit and instruction; for the fundamental principles, government, and doctrine of the Church are vested in the keys of the kingdom.” The keys are held by the prophets, seers, and revelators—the apostles—today and controlled solely by President Monson. Any new doctrine that should be taught to the Latter-day Saints will come through them. This is another reason why Denver Snuffer’s message is in error–he has no keys. I discuss this in Part 2. First off, the phrase “you must unlearn what you have learned” is a statement by Yoda in the Empire Strikes Back, so two things are already apparent when I read your comment: 1.) you have assimilated lines from the Star Wars films into your regular vocabulary (either intentionally or unintentionally), and 2.) you quoted a well-known line from a famous film without giving credit to the line’s origins. You could just have very well said “Dear Brian, you’re going to need a bigger boat,” or “Dear Brian, I’m going to make you an offer you can’t refuse,” or maybe “Dear Brian, snakes…why’d it have to be snakes?” What all of this says about you, I don’t know; but I thought it should at least be pointed out. Second, and as an overall point with regard to Mr. Snuffer, I find it puzzling that he and/or his supporters tend to invoke the name of Hugh Nibley as some sort of overture that Mr. Snuffer is, in some respect, “continuing the legacy of Dr. Nibley’s approach to the gospel.” Nothing could be further from the truth. For one thing, there was never a more passionate advocate for the prophetic calling and teachings of Brigham Young than Hugh Nibley (even a cursory examination of Dr. Nibley’s writings reveal this to be true). Nibley even had a tendency to sometimes simply use the phrase “Joseph and Brigham” as an almost joint partnership of bold men who helped restore to the minds of mortals the true potential of the human race. In short, Nibley loved the brashness and boldness of Brigham Young because he himself was brash and bold. Suggesting that Snuffer is somehow “in line” with the tradition of Hugh Nibley (which, again, seems to be present in what I see from other Snuffer supporters, not necessarily from you) demonstrates a lack of genuine and objective research and investigation. To paraphrase Alma: “…ye do greatly err, and ye ought to search the [writings of Hugh Nibley]; if ye suppose that they have taught you this, ye do not understand them,” (Alma 33:2). It’s interesting that there’s no DNA proof that Joseph never fathered children with anyone besides Emma, although absence of evidence is not evidence of absence. For me, the stronger proof that Joseph didn’t have any children through polygamy is that there are so few people who have claimed to be descendants of Joseph (Is Josephine Rosetta Lyon the only one?). The circumstances of her story seem unusual, that her mother only told Josephine of her parentage on her deathbed. I would think that if I were Joseph Smith’s child, or the mother of Joseph Smith’s child, I would be shouting it from the rooftops. I would be mormon royalty, and I might even have a dubious claim on running the LDS church. No mother would keep this secret from their child. Brigham and the 12 probably would not be inclined to cover this up, indeed they might also broadcast the fact that Joseph had a child through polygamy, to legitimize their own polygamy. Any polygamous child of Joseph’s would’ve testified to it in the Temple Lot case. As I say in the essay, the evidence for Josephine is not negative, it is just inconclusive due to cross marrying between the two genealogical lines. Also, we have two separate attestations for Olive Frost’s child who died in infancy. I disagree that Josephine would have been questioned in the Temple Lot trial. Her mother was dead (1982) and she knew nothing more than what her mother had told her. We agree that there is no additional evidence of offspring except for a reference to a miscarriage, a few accounts from Bathsheba Smith of a birth (with Emma the midwife), and a couple of quotes from Mary Elizabeth Rollins. Are these conclusive that Joseph Smith had offspring? Depends on the reviewer’s decision. For me, it’s still about the incentives–once the saints were in Utah, there’s no incentive to hide any of Joseph’s children, and plenty of incentive not to. As I said, we can only document two children and only one that lived to adulthood. Speculating on others is no helpful. Brigham Young died in 1877; his daughter, Susa wrote: “Father and the Twelve Apostles felt the death of the Prophet far more keenly than did the people; and as we believe that children are a part of the glory we inherit hereafter, it seemed a cruel thing that the beloved leader and Prophet should be stricken down in the prime of life, and left without issue in this Church.” Joseph F. Smith also embraced the belief that his uncle, the Prophet, had no children with his plural wives in 1879. Before we parted… I said, “Joseph, you have asked where is the issue in evidence of your father’s having married plural wives.” I will now refer you to one case where it was said by the girl’s grandmother that your father has a daughter born of a plural wife. The girl’s grandmother was Mother Sessions, who lived in Nauvoo and died here in the valley. She was the grand-daughter of Mother [Patty] Sessions. That girl, I believe, is living today in Bountiful, north of this city. I heard Prest. Young, a short time before his death, refer to the report and remark that he had never seen the girl, but he would like to see her for himself, that he might determine if she bore any likeness to your father. Joseph hereupon said, “Did you ever go and see her?” “No sir, I did not.” “Then there is where you have not done what you ought to have done. You should have gone to see her for yourself, and so satisfied your own mind.” I said, “The woman is now said to have a family of children, and I think she is still living. [”] He replied, “I have heard of that case, but have understood that the girl was born more than a year after my father’s death. I said, “I think you are mistaken or have been misinformed regarding this girl, for I have been told that her grandmother, Aunt Patty Sessions, asserts that the girl was born within the time after your father was said to have taken the mother.” Josephine was born February 8, 1844. What evidence do we have that section 132 as we have it today was what joseph smith originally dictated? Do we have the original transcript? “On the morning of the 12th of July, 1843, Joseph and Hyrum Smith came into the office, in the upper story of the brick store, on the bank of the Mississippi River. They were talking on the subject of plural marriage. Hyrum said to Joseph, “if you will write the revelation on Celestial marriage, I will take and read it to Emma, and I believe I can convince her of its truth, and you will hereafter have peace.” Joseph smiled, and remarked, “you do not know Emma as well as I do.” Hyrum repeated his opinion and further remarked, “the doctrine is so plain, I can convince any reasonable man or woman of its truth, purity and heavenly origin,” or words to their effect. Joseph then said, “well, I will write the revelation, and we will see.” He then requested me to get paper and prepare to write. Hyrum very urgently requested Joseph to write the revelation by means of the Urim and Thummim, but Joseph, in reply, said he did not need to, for he knew the revelation perfectly from beginning to end. Joseph and Hyrum then sat down, and Joseph commenced to dictate the Revelation on Celestial marriage, and I wrote it, sentence by sentence as he dictated. After the whole was written, Joseph asked me to read it through, slowly and carefully, which I did, and he pronounced it correct. He then remarked that there was much more that he could write, on the same subject, but what was written was sufficient for the present. The Clayton copy was destroyed by Emma or at her request. The Kingsbury copy was kept by Bishop Whitney and given to Brigham Young in Winter Quarters. It is now in the possession of the Church and will be available for download in the next few weeks or months (according to a CHL employee who knows). Since Kingsbury died in 1898, the left several testimonies concerning the accuracy of the copy he made that was later published as section 132. Anyone claiming that changes were made to the document either needs to discredit Kingsbury as a credible witness or allege that somehow the Clayton copy was tampered with before Kingsbury received it in 1843. Neither seems to be an easily defended argument. I appreciate the thorough reply. I asked because Denver already posted a response to some aspects of your essay and it seems he suspects that section 132 had been altered by BY or others later on to justify their version of polygamy. The evidence you presented is compelling. This is a difficult subject for me and I assume at least some others because it would be nice to be able to believe that JS never did have sexual relations with any other women. It is what many of us I think would like to discover because the idea that God commanded secret polygamy often times against Emma’s wishes is a hard thing to make sense of. But, if the evidence truly shows that he did have sexual relations with other wives, we don’t want to ignore that evidence and believe in something that is false. I believe that anyone who alleges that D&C 132 has been altered or forges hasn’t studied the historical documents associated with it. Within the next year (and possibly soon) the Church will make the Kingsbury copy of the manuscript available. I have not seen it, but I’m confident it matches D&C 132 faithfully. So Snuffer will need to say that it was changed without Kingsbury’s knowledge between the time it was dictated to Clayton and then delivered to Kingsbury to copy (which was hours or a day or two at the most). Or that the Church’s Kingsbury copy is a forgery. This is difficult because both Clayton and Kingsbury lived well beyond the publication of the revelation and both testified it was a faithful copy. Otherwise, they both would have needed to be co-conspirators. The provenance of the Kingsbury copy to 1852 (when it was published) is well documented. As I say in both Part 1 and Part 2 of my responses, it sometimes seems Denver Snuffer wants to rewrite history to fit his needs. Sorry but it just doesn’t work that way. Comment removed per commenter’s request. I disagree that the Church discourages scholarly tools. The Lord told Joseph Smith early to “STUDY it out” in our minds (D&C 9:8-9). We are to learn “by STUDY and by faith” (D&C 88:118). If we don’t study, then we will be more easily deceived. Joseph Smith warned: “Behold, verily I say unto you, that there are many spirits which are false spirits, which have gone forth in the earth, deceiving the world” (D&C 50:2). The apostle John similarly warned: “BELOVED, believe not every spirit, but try the spirits whether they are of God: because many false prophets are gone out into the world” (1 John 4:1). It is easy to claim Joseph was a “liar” regarding polygamy—it is the low hanging fruit for critics who really haven’t looked at his statements. They would also condemn Abraham because he didn’t tell King Abimilech (Genesis 20:2) that Sarah was his wife. A liar? Joseph could truthfully deny practicing legal polygamy, but he never denied practicing celestial marriage. I’m happy to give Denver Snuffer the privilege of interpreting the evidence as he wishes according to the spirit that he follows. What I don’t think is acceptable, is for him or anyone (including myself) to ignore the evidence. This is why I’ve uploaded my entire polygamy database to http://MormonPolygamyDocument.org. Denver stated that he had copies of my three volumes JOSEPH SMITH’S POLYGAMY: HISTORY AND THEOLOGY, but as I read his essay on “Plural Marriage,” I wonder if he read them. Joseph Smith also taught: “Nothing is a greater injury to the children of men than to be under the influence of a false spirit when they think they have the Spirit of God” (TPJS 205). I encourage you to prayerfully study ALL the evidences and then decide if Denver is correct regarding his statements concerning Joseph Smith and plural marriage. I sometimes wish there was a simple like or recommend button for some of these articles. While I can respect the efforts that go into a lot of these articles, I think the above is one of the most invaluable articles the Interpreter has ever published. David, there are simple like and share buttons at the top of this article on the right-hand side. These buttons are present on all of our articles. Ah, I’m viewing this on a tablet, so that might explain why I can’t see them! Carry on! (I’d already shared a link to this, but really just wanted some way to express my high opinion of the article, though I guess my comment partly did that). I watched a youtube video of you, Brian, in 2012 in which you said that you thought the polyandry marriages were non sexual for eternity only marriages. In this 2015 essay rebutting DS, it seems that you are saying that at least some of the polyandrous marriages were sexual. Am I understanding you correctly? I’m not sure what video you watched but I have never said that all of Joseph Smith’s sealings to legally married women were non-sexual “eternity only” sealings. I have been misquoted by quite a number of people who have alleged that I have said that. Now with that stated, it is important to clarify that I do not believe Joseph Smith ever practice sexual polyandry nor would he have tolerated it in others. Of the fourteen women with legal husbands, I believe 11 were “eternity only” sealings for the next life only. Of the three remaining women, one was a pretend marriage (by their own accounts Sarah Ann Whitney with Joseph C. Kingsbury), one had experienced a Church divorce (Sylvia Sessions Lyon from Windsor Lyon), and the last is Mary Heron who is too poorly documented to know precisely what was going on although my wife doesn’t think it was a real relationship. If you are more interested. Brian, thank you for publishing these articles. I have enjoyed your work on this subject for a while now. I have four comments/questions. As a Latter-day Saint, I recognize that the majority of evidence comes from faithful Latter-day Saints. This leads me to having only a few choices–either burying my head in the sand and ignore this uncomfortable subject or accept that Joseph Smith introduced polygeny to the Church and practiced it. If I were not a member, I either wouldn’t care or would use it as evidence of Mormon barbarianism. However, if I belonged to a Latter-day Saint tradition that does not recognize Brigham Young or his successors–such as the Community of Christ or Snuffer, I do think I could easily discredit a large amount of evidence because it was (1) late (25 to 40 years after the fact), (2) was pushed by people with an agenda and thus suspect. My question is whether there is any primary evidence outside of faithful Latter-day Saints from 1869 to the early 1890s including D&C 132? I know you have addressed this a bit in the article and the comments, the evidence you cite is still from faithful Latter-day Saints. My second issue is with John C. Bennett. You claim Bennett could not have known anything direct from the Prophet because they became estranged in about May 1842 at which time Joseph only had 7 plural wives. On the other hand, Joseph told members of the Twelve and others in the fall of 1841. We need to remember that Bennett was in fact close to the Prophet. He was a member of the First Presidency (as an assistant counselor). He was Mayor of Nauvoo (Joseph was on the City Council at the time). He was Major General and Chief Commanding Officer of the Nauvoo Legion while Joseph was Lieutenant General and Chief Reviewing Officer of the Legion. Bennett was the state’s quartermaster general in the militia when the saints were fleeing to Missouri. He was very helpful to the saints in getting Nauvoo set up and getting the charters for the city, the legion, and the university through the Illinois legislature. All that said, I don’t believe what Bennett said about “spiritual wifery” and his own actions matched anything Joseph might have told him, but the evidence against Bennett learning from the Prophet seems quite weak to me. Somewhere I heard a story that Emma heard something in a barn and when she peaked through a hole she saw the whole affair or something like that. It has been a long time since I read it. I recall interpreting that story not as witnessing Joseph and a women making love, which in my opinion may not have had Emma starring at them throughout wondering what to do, but rather that Emma caught them getting married in front of somebody marrying them and in front of witnesses. Do you remember the story and does this interpretation make sense? June 2008. This paper opened my eyes a bit about polygyny and how scholars study it. Almost all ancient cultures, except Greece and Rome, had high levels of polygyny. Scholars use a polygyny index to compare societies. Point one is that in Greece and Rome, the marriage pattern was “Socially Imposed Universal Monogamy” of SIUM, where from the beginning of the classic period in Greece and as far back as can be seen in Rome, monogamy was enforced by laws and custom and this is where the idea that polygyny is barbarism comes from. The second point is that two factors govern the degree of polygyny in different cultures–the first is differences in male economic power. The larger the inequality, the larger the polygyny index. This made sense. Then the author quotes several studies showing that female choice in mating is essential as well (caveated with the fact that often the female choice is in fact made by the family of the female). The idea seems to be that the greater the disparity of economic resources among the males, the more desirable it is to be married to a male with considerable economic resources, even if that means sharing the male, then to be married to one without economic resources. Thus, the article claims that the larger the economic disparity among the males, the better off females are with high levels of polygyny (and the author quotes female scientists making that point). Polygyny benefited women up and down the spectrum and benefited men at the top but not men at the bottom of society, at least according to the article and its sources. This got me thinking. I don’t think the practicers of polygyny in Nauvoo were the economic elite. Instead, I can’t help wondering whether in Nauvoo economic resources of the male should in fact be replaced by potential in the eternities. Faithful women saw a small pool of men who could take them to exaltation. Today, we realize that the pool is much bigger and I can’t help wondering if there wasn’t a higher urgency to be sealed and ensure exaltation then as opposed to now. Comments? True, many sources are years old and by mainstream faithful; however, there are a number of contemporary evidences substantiating JS as the proprietor/restorer of Nauvoo polygamy (both faithful and unfaithful to JS). The 1842 Whitney letter revealing JS’ polygamous sealing ceremony. Thank you for the comments on William Clayton’s journal (which I see is quoted above) and also that the Law’s Nauvoo Expositor referencing items in D&C 132. I’m unaware of any plain references to authorized plural marriage in the Nauvoo Council minutes. John C. Bennett (See The History of the Saints: Or an Exposé of Joe Smith and Mormonism (Boston: Leland & Whiting, 1842). William Law’s journal and the Expositor (Lyndon W. Cook, William Law: Biographical Essay – Nauvoo Diary – Correspondence – Interview, (Orem, Utah: Grandin Book, 1994). Thanks for that list of contemporary evidence. I’ve found it very useful. The revelation to NK Whitney is a very compelling piece of evidence if true. I found the text of that revelation on the website you referenced (http://mormonpolygamydocuments.org/wp-content/uploads/2015/01/JS1685.pdf). However, I can’t find the actual document online anywhere. Is it possible to view the actual document? Have you ever seen it? I’m surprised the church doesn’t release the original since it would help bolster its claims regarding plural marriage. I also wonder whether this piece of evidence isn’t actually contemporary. Is it possible Whitney recorded it later in life but indicated it was given in 1842? In that case, it wouldn’t be contemporary obviously. Anyway, any other light you can shed on that would be very helpful. Thanks. You bring up a good point. I actually did not seek to verity Michael Marquardt’s reference. To my knowledge, no one has doubted this. I have to think that the Joseph Smith Papers project will eventually publish it and I have watched for that. I can’t find it on the website yet. Hopefully they will upload it soon. Thanks for the response. Hopefully the church releases it soon. I’m also looking forward to seeing Kingsbury’s record of 132. I have another question, about your reference to Oliver Olney. I found the item you referenced on p 45 of this link: http://mormonpolygamydocuments.org/wp-content/uploads/2014/11/JSP_Book_49.pdf. I read through the entries but Olney never mentions a firsthand account of being taught about plural marriage by Joseph or anyone else. He does make some references to the 12 having illicit relations w women and he references Joseph’s supposed passion for women but nothing direct. While it is contemporary, there’s no evidence its a firsthand account unless I’m mistaken. Did I miss something? Thanks. Oliver Olney was married to Alice Johnson, a sister to Marinda Nancy Johnson Hyde, who was the wife of Apostle Orson Hyde. Marinda herself was sealed to the Prophet and had served as an intermediary in his plural marriage proposals. Oliver undoubtedly enjoyed and exploited this tie as much as possible. However, it was curtailed or diminished when his wife died in July of 1841, leaving Olney with two young daughters. Whether Alice’s death greatly affected Oliver’s mental stability is unknown, but it appears that something happened in 1841 to alter the trajectory of his life. In early 1842 Oliver made claims that he was in visionary contact with the “Ancient of Days,” presumably Adam. He reported teachings that were contradictory to Church doctrines and was excommunicated on March 17, 1842. Olney was never a polygamy insider and was a rather questionable poet :-). The first few pages are a later copy by Willard Richards, but the Kingsbury copy begins with item 9. This article is written as an exposé with the implication that Denver Snuffer was dishonest about the evidence he marshaled to present his view. However, I thought he was very clear throughout his talk that he found the evidence presented in this article as unpersuasive. He focused his thoughts on evidence he thought was more relevant to the issue at hand. I tend to agree: statements, affidavits, and court testimonies written fifty years later by individuals who have a vested interest in legitimizing the practice of polygamy are less reliable than statements made by Joseph Smith and/or statements made concurrently with the issue in question. This article would look very different if Hales stuck to evidence originating before the death of Joseph Smith. Almost all of the evidence Hales uses to support his view was generated: (1) after the death of Joseph Smith; (2) when the descendants of Joseph Smith challenged the Brigham Young’s position as the rightful heir of Joseph Smith’s leadership position; and (3) when LDS Church was fighting a battle with the Federal government in an effort to make polygamy a fundamental part of the religion. The historical mess is complicated by the fact Brigham Young ascended to the his Presidency under the campaign promise that he would deliver the leadership position to a descendant of Joseph Smith when he ‘came of age’ (I’m betting that the descendant of Joseph Smith that came to Utah to claim his scriptural mandate was not a polygamist). It is messier still because the LDS Church had a culture of ‘lying for the Lord’ in its fight for polygamy against the Federal government. There seemed to have been a strategic effort made by Brigham Young to make polygamy a fundamental aspect of the religion. And with the recent Supreme Court cases on gay marriage we all know why: if you can convince the Court that the practice is a fundamental part of your religious beliefs then the practice is a protected under the Constitution. Witnesses who are willing to connect polygamy to Joseph Smith (as practiced in the late 1800’s) can kill two birds with one stone: insulate Brigham Young from the claims of Joseph Smith’s descendants AND protect the Church from the claims of the Federal Government. In my mind (and apparently in the mind of Denver Snuffer), it makes many of the testimonies cited by Hales as unreliable. I appreciate the tone of this response, but I disagree that Part 1 was an “exposé.” It does not appear to me that providing historical documentation for an event (Joseph Smith’s plural marriages) would normally be considered an exposé. Regardless, it is necessary to point out a few problems. First, the author is accurate that “This article would look very different if Hales stuck to evidence originating before the death of Joseph Smith.” Joseph Smith left only D&C 132 (which some debate is from him, but the provenance is pretty solid for objective observers). The only other contemporaneous sources friendly to the Prophet are entries in the journal of William Clayton. However, if we look beyond believers, we find contemporaneous statements from Oliver Olney, William Law, Joseph H. Jackson, and even John C. Bennett so accurately Identified five of Joseph Smith’s plural wives. These men corroborated the existence of plural marriage in Nauvoo although their accounts do not agree with each other and manifest other weaknesses. The biggest problem, in my view, with Denver Snuffer’s interpretation (which is supported by “Enos”) is the alleged conspiracy that must have occurred to support Nauvoo polygamy memories of events that allegedly never took place. In 1869 Joseph F. Smith collected over 50 affidavits and testimonials. In the 1880s, Andrew Jenson collected dozens of testimonials separately and published them in 1887. Lastly, in the 1892 Temple Lot cast multiple Nauvoo polygamists were deposed. All of these attestations tell essentially the same story, but there is no evidence of collusion. Beside the volume of testimonies, another real problem is the chronology. Plural marriage didn’t burst on the Utah scene with claims of Brigham Young who tried to tie it back to Joseph Smith. Plural marriage started in Nauvoo with families of multiple wives and children there that expanded in the west. The first baby born from a sealed polygamous marriage was, according to my research, Adelbert Kimball, son of Heber C. Kimball and Sarah Peak Kimball, born in late 1842 or early 1843. He lived less than a year. Sarah stayed with the Kimballs during her confinement. The second child of a polygamous couple appears to have been George Omner Noble, born on February 2, 1844, to Joseph Bates Noble and Sarah Alley Noble. Other children were born to polygamous wives in the years that followed. Their lives are a testament to the practice of full plural marriage. Hundreds of plural marriages were performed in the Nauvoo Temple in 1845-1846. Are we to believe that Joseph taught it, that children were born to OTHER plural wives, but that Joseph never consummated his plural unions? Coupled with D&C 132:63, which state plainly that “multiply and replenish the earth” is a reason for plurality, the idea that the Prophet didn’t or wouldn’t have tried to have children with his plural wives is problematic. Add several attestations from the wives themselves, several under oath, that the marriages were consummated and disbelief becomes difficult. I don’t wish to be overly critical, but the cognitive dissonance embraced by those who deny Joseph Smith’s plural marriages is remarkable to me. Of course we all have the right to choose what we believe. However, believing any voice, including Snuffer, who denies historical events that are supported by literally hundreds of attestations from individuals who not only witnessed the activities, but describe their own personal participation, even if the records were made later, is pursuing a path based upon falsehoods. The traditional narrative that most LDS embrace relies on the existence of a rather large and well-orchestrated conspiracy. Otherwise, how would one explain the repeated denials of not only Joseph, but many other contemporary participants in Nauvoo polygamy? Many of the same people that you cite as proof that Joseph did teach and embrace polygamy were adamantly denying the practice existed whilst in Nauvoo (John Taylor, Wilford Woodruff, Eliza Snow, Brigham Young, and many, many others). At a church meeting of about 8,000 people in 1844 “A Voice of Innocence” was read to the congregation to which the crowd said “amen” twice. This document denounced plural marriage. Ironically, Brigham Young was the very next speaker. So the inconvenient truth is that the traditional narrative that you defend (and do so very well I don’t mind saying) presupposes a rather large and effective conspiracy to cover up polygamy and it originates with Joseph Smith. Is that conspiracy any more believable than the one you’re now questioning? As for Adelbert Kimball, I recommend further research. He is also known as “Adelmon”. Sarah Peak’s husband, William Noon, abandoned her about the same time she married HCK. Sarah’s final child born by her previous marriage has the same birth and death date as this child. The only possible conclusion, then, is that these two children are the same. Here’s one family history that shows Adelbert as the child of William Noon: http://www.watsonclan.com/getperson.php?personID=I8516&tree=watson. Even if it was HCK’s son it would have been very easy to claim the child was William’s. Regardless, it’s not reliable proof of a child born from a polygamous union and known to Joseph Smith. The other child you mention, born to Joseph Nobles, is less easily questioned. He was born in Montrose, IA rather than Nauvoo, however. What’s strange to me is that there were approximately 25 men married to 40+ women and over a 3-year period there were only two children allegedly born (Nobles’ and Clayton’s). Contrast that with the 14 children born from polygamous unions in 1845-1846. Also, I still don’t know why you cite Olney. I’ve read your source material for him on your website and he only references other people’s claims. He’s not a first-hand witness from what I see, although maybe I missed it. Thanks for the comments. You mentioned the “denials” of polygamy in Nauvoo as evidence that celestial plural sealings never occurred. I wonder if you have ever looked carefully at the language of the “denials.” There are no denials of celestial marriage. There are no denials of eternal plural marriage. The language in every case seems to allow for plural marriage that was not an official Church doctrine (because it wasn’t at the time) and was not legal polygamy (because it wasn’t) and was not polygamy as practiced by the Turks etc. No one ever asked Joseph if he practiced polygamy like Abraham or whether he had women sealed to him as plural wives in the new and everlasting covenant of marriage. Those are the only questions he had to answer “yes,” to. Simple questions about whether Joseph was practing John C. Bennett’s spiritual wifery or to plain polygamy could be truthfully answered “yes.” The document, “A Voice of Innocence from Nauvoo,” was consistent with this, denying Bennett’s spiritual wifery, but not addressing eternal sealings, whether monogamous or polygamous. You and I see this as splitting hairs, but it was the primary tactic used by Joseph Smith to not bear a false witness while introducing plurality among selected Saints. Your observation that we have few records of children born in the 1845-1846 period may have merit, but in my view, not much. I haven’t researched the possible offspring from these unions, maybe you have. 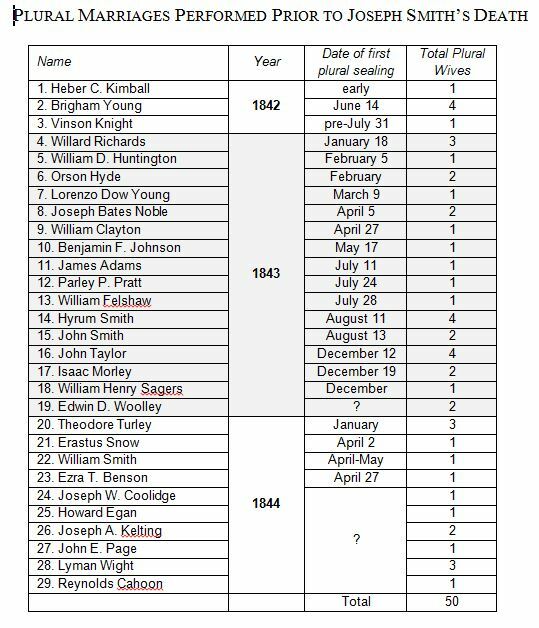 Even if the number is lower than expected, the fact that these men and women reported their plural marriages, which were each approved by Joseph Smith, could be a conspiracy or it could be the truth. Even one child could be sufficient to successfully contradict the theory in my view. Otherwise, the conspiracy began early and expanded rapidly with no apparent evidence of a centralized coordinator. Since some of the testimonies are from Nauvoo members who later apostatized, it is interesting that they too would join the conspiracy without exposing Brigham Young as the perpetrator. So do we believe that Almira’s testimony is part of a conspiracy? It was very late so maybe it can be dismissed on that alone? But why would she attest to such details? Sorry this is so long, but those who wish to dismiss these types of evidences will have a big job because there are so many from so many diverse sources. The church recently published two copies of the alleged 1842 revelation to Newel Whitney that you cite above. You can view it here: https://dcms.lds.org/delivery/DeliveryManagerServlet?dps_pid=IE537711. Do you know whose handwriting that is? I’ve checked several people but so far haven’t found what looks like a match. Marquart claims it’s Joseph’s handwriting but it doesn’t look like his writing to me, although i am admittedly not an expert. For Joseph’s handwriting, see this link: http://josephsmithpapers.org/paperSummary/letterbook-1?p=7#!/paperSummary/letterbook-1&p=9. Thanks. Thanks for the link. I didn’t know that the manuscripts were available online. As I’m sure you recognized, there are actually two copies of the document on that link and they are in different handwriting. I couldn’t tell you which, if either, is Joseph Smith’s, and unfortunately I haven’t pursued it. Michael Marquardt was the first to make me aware of that document back when I was researching in the late 2000s. I used his transcript from THE JOSEPH SMITH REVELATIONS: TEXT AND COMMENTARY in my book. I have used him to authenticate handwriting before so I highly respect his opinion even though he is not a professional. I think it is great that the Church is making all these documents available! Sorry I can’t be any real help here. Actually I’m pretty sure both are written in the same handwriting. They look identical to me. But regardless, thanks anyway. Did you friend Michael Marquardt authenticate the handwriting in this document for you yet?